New partnerships with Your Neighbourhood Credit Union (YNCU) and the Kitchener Waterloo Community Foundation (KWCF) are helping to expand this grant program to $85,000 per year for the next 2 years. In total, we have awarded grants to over 20 different resident groups from across the city. In total, NMG grants have been awarded in nine of the city’s 10 wards including mural projects, traffic calming, street parties and festivals that bring people together as well as seating projects and other structures that enhance neighbourhoods across the city. Kitchener’s Neighbourhood Matching Grant was established in 2014 to support resident-led, city support projects in neighbourhoods across the city. In its first three years, ten projects received funding. In February of 2017, the total funding was tripled from $20,000 to $60,000 and the maximum grant amount was tripled from $5,000 to $15,000, resulting in an explosion of interest. In 2017 alone, twelve projects from eight of the city’s ten wards received $58,695 in funding. The Neighbourhood Matching Grant accepts applications any time of year, for up to $15,000 per project or a maximum of $2,000 for events. Any group of residents can apply. Ideas must be one-time projects intended for a neighbourhood audience and on accessible public land in Kitchener. Past ideas that have been funded include information boards, cob ovens, murals, painted crosswalks, street parties and plantings. The city offers its thanks to United Way Waterloo Region Communities for its partnership over the last three years, and looks forward to continuing to partner and invest in Kitchener neighbourhoods in other ways in the coming years. The Neighbourhood Matching Grant is a key component of Kitchener’s Love My Hood strategy. 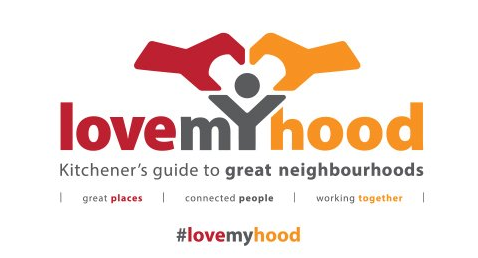 Love My Hood encourages residents to take the lead in making their neighbourhood great, and the city is committed to supporting them along the way. To apply for a Neighbourhood Matching Grant, visit lovemyhood.ca. Visit the Ideas and Inspiration section of the City of Kitchener website to read stories of resident-led projects in Kitchener and get ideas of the types of projects that are eligible for this grant. The Kitchener Waterloo Community Foundation (KWCF) enables people, companies and organizations to do more good by making it easy for fundholders to give and for charities to receive money. When you make a donation to the KWCF, they invest that gift into a permanent endowment fund which generates income that is then distributed through grants to support a wide range of charitable causes within our community. As a leading community-building organization in Waterloo Region, the KWCF is focused on collaborating with partners to identify and meet current and future needs of our community, by enabling social capital and developing creative forward-thinking innovative solutions for place-based philanthropy.